The term “Nano” in nano technology comes from a Greek word “Nanos” which means “Dwarf” i.e. abnormally small. One nanometer is one billionth of a meter or 10-9 meter. Nanotechnology can be considered as a technology of design, fabrication and application of nanostructure and nanomaterials. Material in nanometer scale may exhibit physical properties distinctively different from their bulk counterpart. Different fabrication and processing techniques for nanomaterial includes top down and bottom up approach, spontaneous and forced process. Nanotechnology has real commercial potential for the textile industry. This is mainly due to the fact that conventional methods used to impart different properties to fabrics often do not lead to permanent effects, and will lose their functions after laundering or wearing. Nanotechnology can provide high durability for fabrics, because nano-particles have a large surface area-to-volume ratio and high surface energy, thus presenting better affinity for fabrics and leading to an increase in durability of the function. In addition, a coating of nano-particles on fabrics will not affect their breathability or hand feel. The properties imparted to textiles using nanotechnology include water repellance, soil resistance, wrinkle resistance, anti-bacteria, anti-static and UV-protection, flame retardation, photocatalytic self cleaning, anti pollen and so on. These multifunctional properties are achieved through changing fabric at molecular level by nanotechnology process. The technology of self cleaning coatings has developed rapidly in recent years. The use of self cleaning coatings is attractive as these are labour saving and effectively improve the appearance. The field of self cleaning coating is divided into two categories: (a) hydrophobic and (b) hydrophilic. Both these types of coatings clean themselves through the action of water, the former by rolling droplets and the latter by sheeting water that carries away dirt. Hydrophilic coatings, however, have an additional property that they can chemically breakdown absorbed dirt in sunlight and the process is known as ‘photocatalysis’. Titania is a well-known photocatalyst. Nanocrystalline titania particles possess high specific surface area, wide band gap (3.2eV), thermally stable, strong oxidizing power, non-toxic. The use of small amount of nano titania finish allows fabric to retain their original physical and comfort properties with high functionality. Existing methods for synthesis titania sol involves completely alcoholic medium or partial aqueous medium along with higher concentration of strong acids to achieve long time stability, small size and transparency. Besides that huge amount of stabilizers, high reaction temperature and vigorous stirring were used in reported methods. These methods are complicated, costly, time consuming, therefore are not commercially viable. 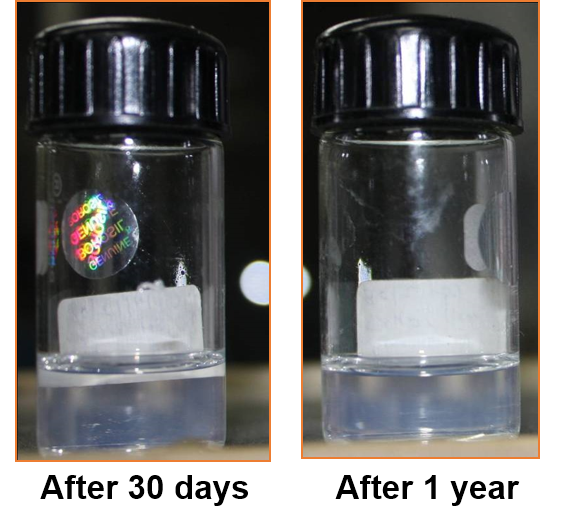 To address these issues associated with the processes known in art for preparation of new composition of transparent aqueous nanosol of titania nanoparticles, a novel, economic and green approach has been developed. The application of sol on the textile substrate has higher efficacy at lower concentration of sol and good adhesion which results in excellent washing durability. Patent- Synthesis and Application of a Stable Titania Aqueous Nanosol on Textile Substrate, Ashwini K. Agrawal, Manjeet Jassal, Ritu Jain and Bhavana Sharma, jointly with Resil Chemicals Company Pvt. Ltd, IP Applied Sept. 2012. Silver is a highly potent antimicrobial agent. The antimicrobial finishes based on silver are yellow to dark brown in color depending on the concentration of silver used. 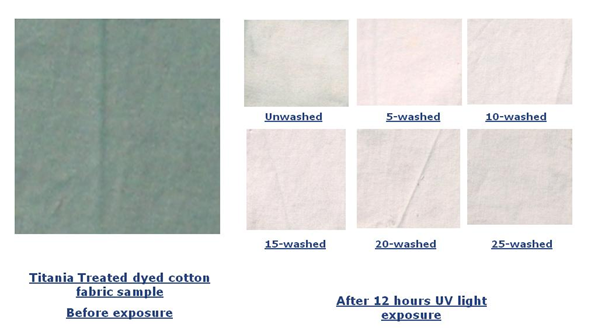 When these dispersions are applied to textile or polymeric substrate they often results in poor aesthetics in terms of lower whiteness index or higher yellowness index, which is undesirable. In addition to that these dispersions are required to be applied in higher concentration for effective antimicrobial activity. Silver dispersion based finishes available in prior art are non durable. 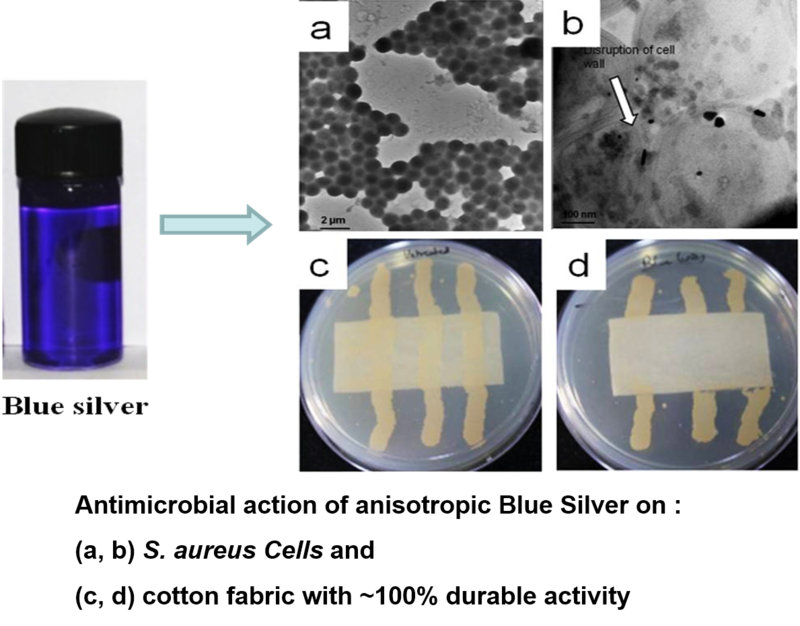 To overcome all the problems, we developed a wide spectrum of silver dispersions (as shown in fig) out of which blue silver shows desirable physical properties along with excellent antibacterial activity. Non-wettable surfaces with high water contact angles (WCAs) and facile sliding of drops, called superhydrophobic or ultrahydrophobic, have received tremendous attention in recent years. These surfaces are of special interest because of properties such as antisticking, anti-contamination and self-cleaning. 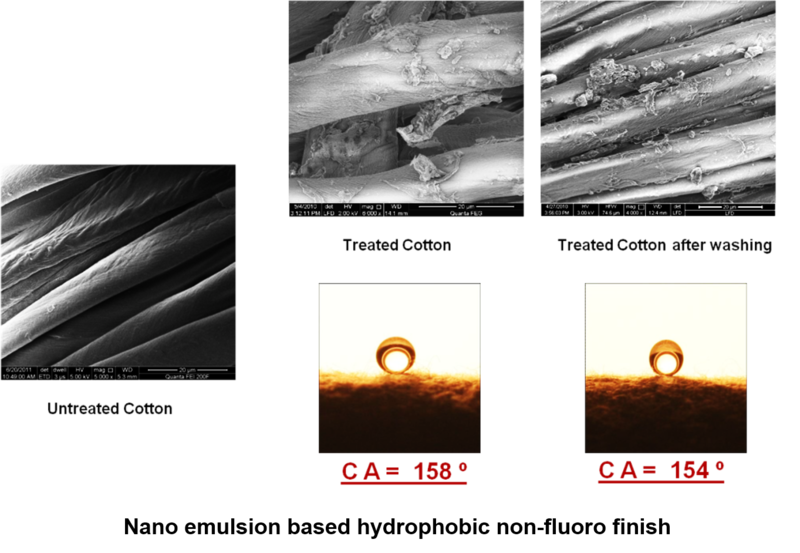 During last half century, many methods of imparting hydrophobic character to cotton have been developed that includes the use of of wax or wax like substances, metal complexes, hydrophobic polymer films and attachment of hydrophobic monomers via physical or chemical sorption processes. But the problems with some of these finishes are their poor durability and/or low breathability. Besides, the application of fluoro finishes on textiles to impart water and oil repellency has shown considerable growth during last decade. However, the use of fluorocarbon finishes is also a major environmental concern due to their toxicity and bioaccumulation. To overcome above problems, a durable non-fluoro hydrophobic finish has been developed. The cool fabric is used to lower down the internal temperature of various architects like tents, pagodas, parking structures, exhibition hangers etc by using IR reflective materials as the main constituent. 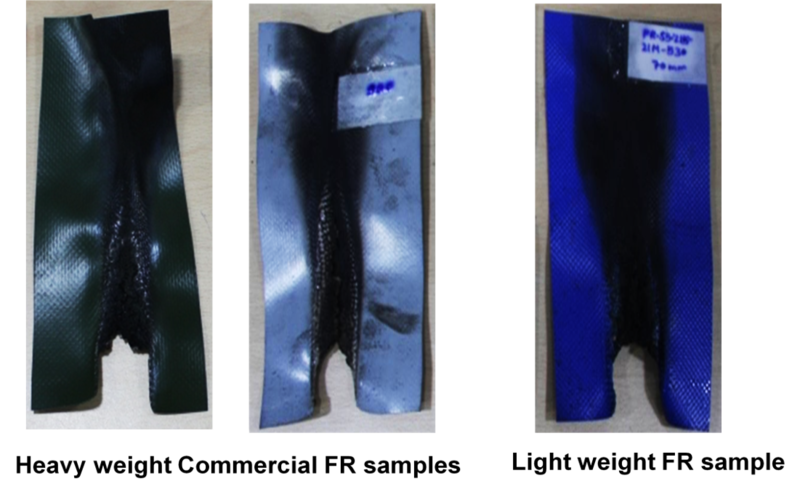 Cool fabric with a significant reduction in internal temperature compared to standard black out fabric has been developed successfully. Due to lower internal temperature, reduced cost of AC and in turn reduced CO2 emission. Flame retardants (FR) are materials that have the quality of inhibiting or resisting the spread of fire. Textile is highly ignitable and contributes to rapid fire spread. However, the ignitable property of a textile can be considerably reduced by any one of the three methods- by using inorganic materials such as Asbestos, Glass etc; by chemically treating the textile with Flame Retardant chemicals; and by modifying the polymer. Commercially available FR fabrics are having high weight (630-1100 GSM) along with high content of toxic FR materials which raises health and environmental concerns. In our Lab, we developed the coating formulations using non-toxic inorganic materials with particles having nano dimension which contains lesser amount of FR materials and additives. Janus particles are multifunctional, anisotropic particles. They are named after the Roman God Janus, the God of gates, which has two opposite and distinct faces. Janus particles provide an advantage over conventional isotropic particles by combining two functionalities on two sides of the same particle. One face of Janus particles can be used for obtaining a characteristic property by covering it with nanoparticles and the other face can be composed of reactive groups for attachment to substrates. We prepared Ag–SiO2 Janus particles with functionalities suitable for textile applications via the low-temperature chemical reduction method using Pickering emulsion. It is hypothesized that these Ag–SiO2 Janus particles can attach on the textile surface because of the affinity of the epoxy group for groups like hydroxyl present on the cellulosic textile surface.